The Visual COBOL Data Tools is available from the SupportLine website and is listed under Visual COBOL AddPacks in the Product Updates section. What are the Data Tools? The Visual COBOL Data Tools is an AddPack to the Visual COBOL development products and it requires one of the following products to be installed to enable installation of the AddPack. 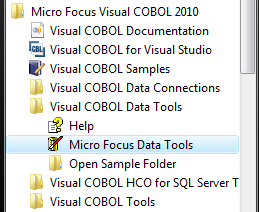 The menus provide invocation of the Micro Focus Data Tools IDE. The IDE uses components of the installed Visual COBOL product and requires a Visual COBOL feature license to be available for execution. 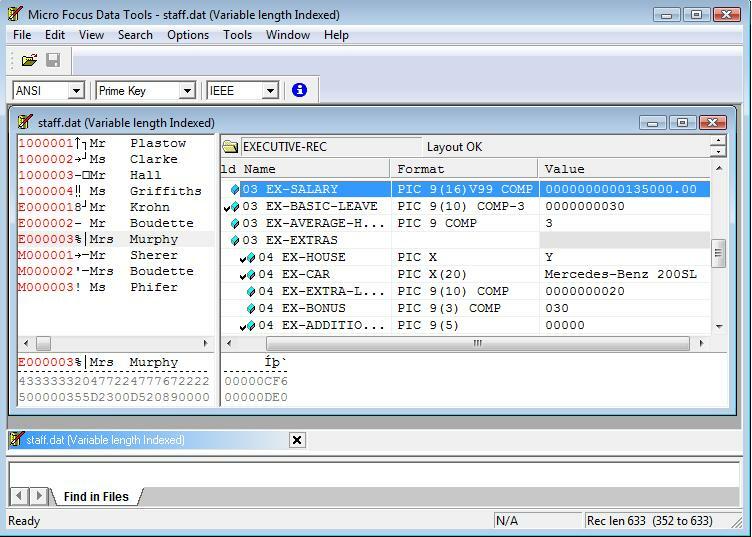 The Data File editor provides creation or editing of data files in the Micro Focus File Handler formats. The editor provides a text display of the records in an unformatted view and can display the current record in vertical hex in a hex view. The editing experience can be enhanced by creating record layouts representing the data types held within the file. The following image shows a record layout view alongside the unformatted view of the records in the file. Editing a data file with record layouts. 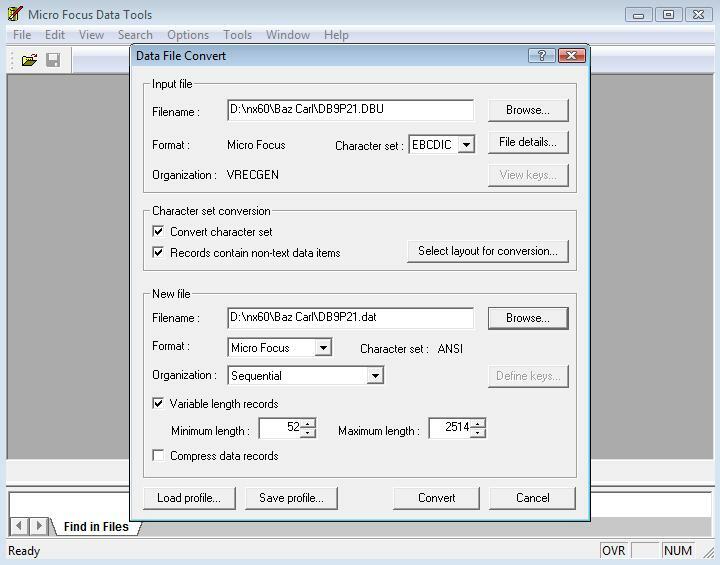 The Data File Convert provides the ability to covert a file creating a different file format or changing the record size or changing the character set (ANSI/EBCDIC) of the data within the records. If records contain non-text data items a record layout can be used to prevent conversion of non-text data items. The following image shows the details of the input file and output file used to convert a file downloaded from a mainframe in EBCDIC format to a Micro Focus format sequential file. A record layout file is used to control the conversion of data items within the records. Converting a data file format and text character set. The Layout Editor provides the ability to create a record layout file for use with the Data File Editor and Data File Convert. The record layout file contains descriptions of the types of records held within a data file. The record descriptions are obtained from the debug file (.idy) created when compiling a COBOL program. When creating the record layout file the Data Division information is loaded from the debug information file and presented in a view. Records are dragged to the layouts view to include them in the layout file. If there are multiple record types within the data file conditions need to be defined to identify the different record types within the data file. The following image shows the creation of a record layout file (.str) that will contain three record types. 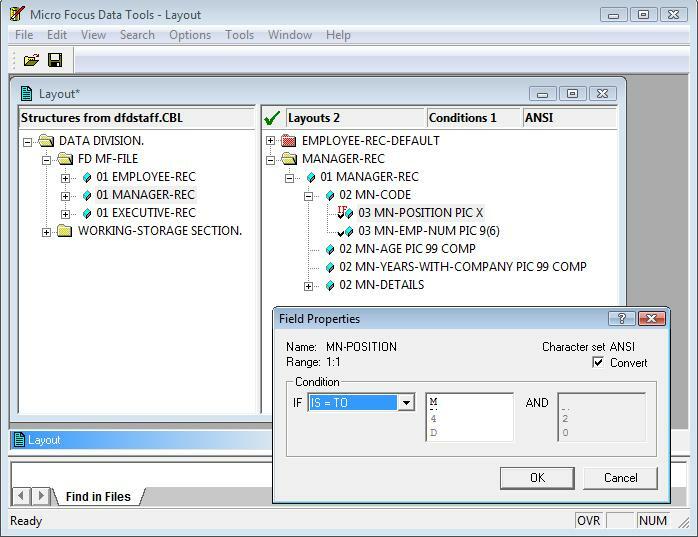 The first record type for employees has been set as the default type and the second record type for managers is being made conditional on the content of a data item within the records. Creating a record layout file with a number of record types. Note: Large numeric data item (38 digit) support is now provided in record layouts. I checked the supportline website and I cannot find the "Visual COBOL Data Tools" download under the product updates or within Visual Cobol R3/R4. Is it generally available or we should wait? Err ... no you can't! Sorry it ain't there yet! Gents, we’re looking into this now. Thanks for letting us know and apologies for the inconvenience. We have fixed the Supportline website. Visual COBOL customers can now download the Data Tools Addpack.